In July Berlin welcomed one of the largest summer conferences – Tech Open Air 2017. This unique festival gathers thousands of representatives of science, technology, music, and art in a huge annual event. For several years already, the venue for the TOA is the former East German radio station Funkhaus Berlin. The conference is a great place to catch informal learning sessions from the best representatives of technology and art, share the experience and get new ideas how to change the world for the better. Though the first TOA festival was organized through crowdfunding only, it grew into a great event that attracts people from various industries. For these few days in July, Berlin turns into a technology center where you can create, learn, network and visit other events throughout the city. Redwerk gladly joined this exciting festival and spent an unforgettable three days at TOA. Speeches took place both inside numerous rooms and spaces and outside, on the river bank. The conference attendee list counted more than 20,000 participants and about 200 speakers. The largest space at TOA was the Haus of Tech arena with the booths of leading companies and promising start-ups. As exhibitors, Redwerk team spent two busy days of never-ending networking and talks, gave out all the spinners we brought as a handout and met some amazing people. 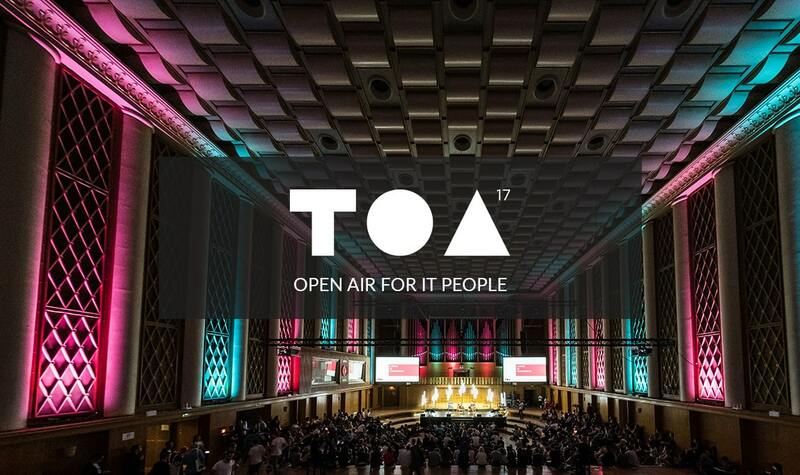 How was your Wednesday at @toaberlin? Redwerk team learned about Rehality — a service that shortens recovery for arm paralysis using VR, an app that allows creating cool beats in seconds — Polyjamer, tasted some candies at a booth of innovative team success platform 12grapes. In the startup lounge, we've also found XapiX.io service that simplifies API integrations and Kinemic — gesture control via wearables. Besides that, we've met lots of students, artists, and freelancers here and found out that fidget spinners are the most wanted handout this summer! TOA exhibition attracted the wide variety of different online platforms: client and business oriented, startups and established companies. The The fastest growing mobile industry offers hundreds of new applications to users around the world, to make their routine easier and life brighter. Look at these awesome apps we found at TOA? During the days spent at TOA, Redwerk team was surprised by the scale of the conference and inspired by the atmosphere. Among the thousands of students, representatives of companies, startups, art critics and technologists, we have found customers, partners, and ideas for development. And after days of learning and networking, closing party was an excellent opportunity to relax and enrich memories about TOA with one more bright moment. Redwerk is a programming outsource company providing services across the globe. As a desktop application development company, we help various industries to digitalize their business. On the other hand, being a mobile application outsourcing agency, we assist in bringing companies to modern presence standards.